They were 8 feet tall, glowing gold from the inside, and resembled giant trumpet flowers. 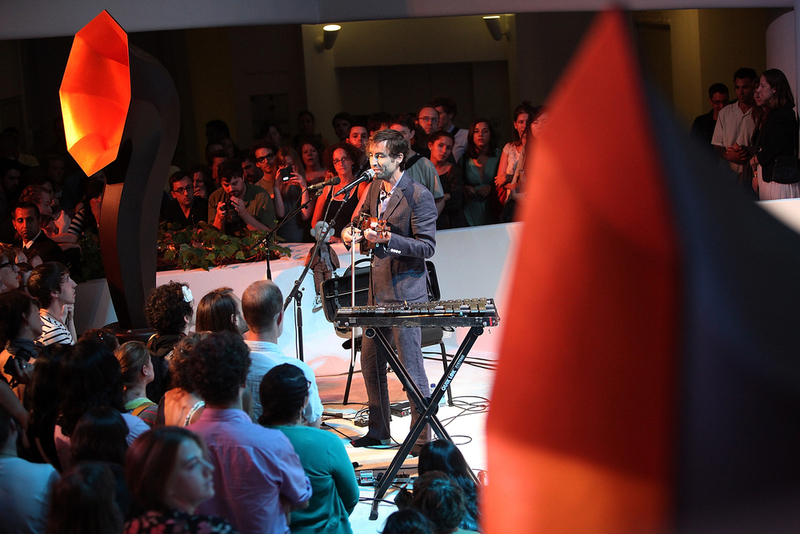 There were 2 of them flanking the stage at an Andrew Bird concert. I didn't know what they were, but I was incredibly intrigued. 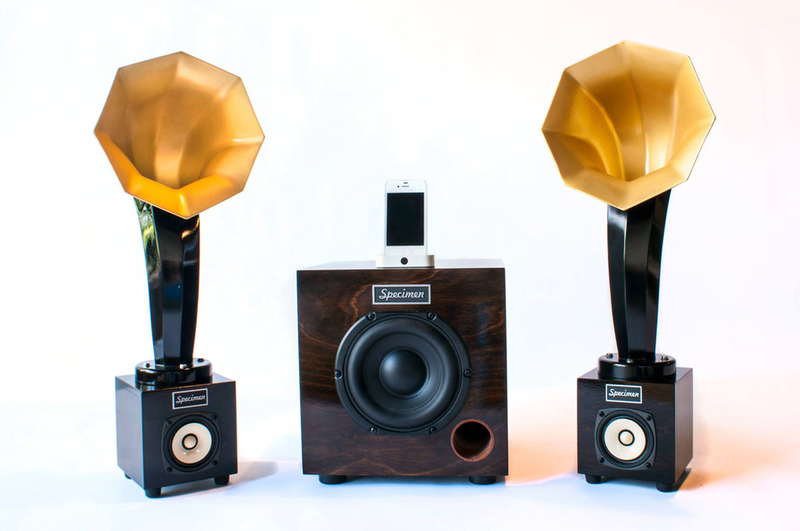 The concert started, and the most mesmerizing sound came out of these gorgeous sculptures. Speakers ! They were speakers ! Not long after that concert, I met their maker – Ian Schneller at a friend’s house. Ian’s passion for everything he creates is thrilling. He told me the story of the spinning double horn speaker he created for Andrew Bird. The first time Andrew played his violin through it, the artisans at Ian's shop cried. 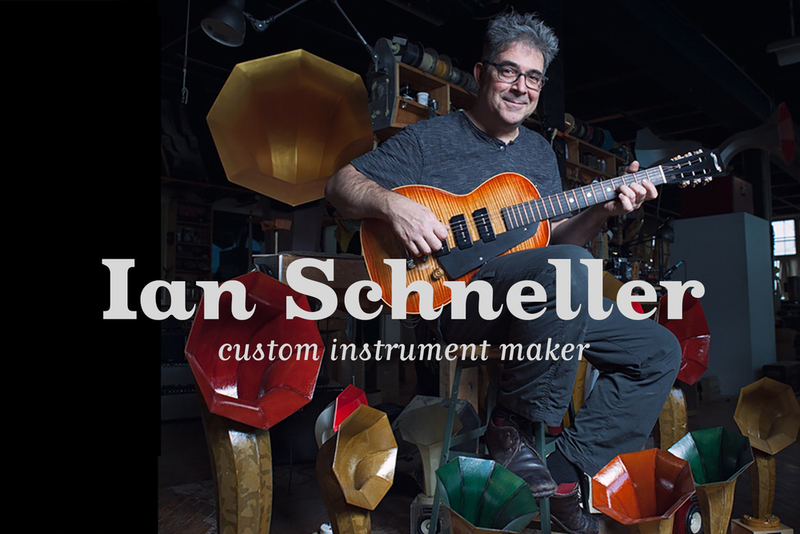 Ian also creates custom instruments for artists such as Wilco, Franz Ferdinand, My Morning Jacket, Lenny Kravitz and Arcade Fire. He credits his Montessori upbringing as the foundation that fostered his creativity. First, think about the most creative thing you have made or are most proud of. Well, the easy answer is my Daughter, Imogen, but as a second to her I would say my Octoblock tube amplifier. It is a massive, somewhat unprecedented manifestation of 1940s electronic infrastructure. It is an eight-channel tube amp and an exercise in excess, but with a modest balance of function. I find great beauty in that. When you create something, do you follow a linear path? Non-linear? Is it fluid and organic or planned out? Chaotic or organized? This is such a wonderful question. I have always espoused a radial notion of time and work. The universe expands outward. I can leave nothing behind. In my life all results are accumulative. All events are lessons. This could be a terrible burden, but also a great tool for technical reasons. It represents good design. Do you remember how you made things when you were young? Has your method of creating changed or evolved over time? I remember how I made everything. I must know how everything is made and understand the tools involved in the making. I cherish these tools. I still have most of my grandfather's hand tools and they will outlive and outperform anything made by today's standards. This creates a feeling of both pride and sadness. It also creates a deep mission to try to preserve a vanishing infrastructure. Where or when do you feel most creative? Always, almost always. I usually wake up with a notion. Something lingering from a dream. Sometimes it is vague and sometimes quite literal. Like a mechanical dynamic, a motion with purpose or a shape with dynamic expression, but usually something which can incubate into something geometrically tangible that I can put into physical action. This is when coffee helps. And paper and pencil. No Lie. I hoard sketchbooks. What environment did you grow up in that helped foster your creativity? Montessori. My mother was a Montessori teacher and I grew up with the Montessori curriculum, so has my daughter. I believe strongly in the tactile interface and sensorial learning methods of Montessori and employ them in my own shop today. My classroom workbenches have been designed and constructed in the tradition of Montessori learning materials, but are perhaps a new version for adults to explore the nuances of this tactile existence and discipline. How do you make something out of nothing? Where does the initial seed come from? By studying nature and its wonderful geometries and substances, an understanding of elemental structure and the physical properties of materials begin to form. 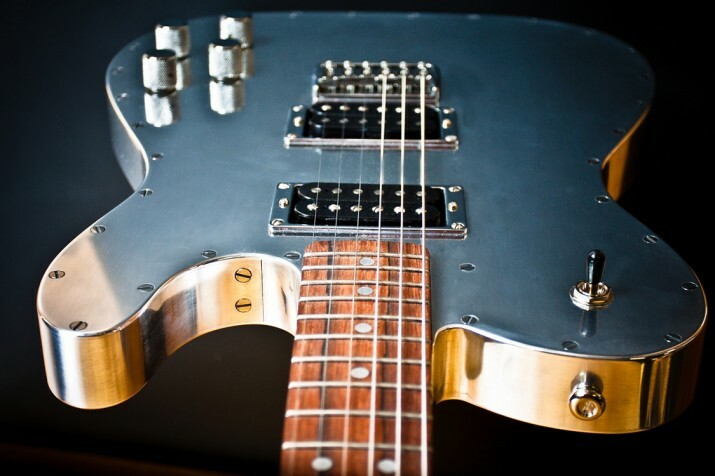 Putting these understandings to use in modest utility, whether it be a tube amp, a stringed instrument, or a horn speaker, is the most beautiful way I can find to tell you what I know. So, the seed comes from seed. Whose creative process do you want to know about? I am afraid I am a bit solipsistic in my approach Most of the people who’s approach I admire were swashbuckling types who are now dead. Da Vinci, Steve Jobs, Duchamp, Tesla, H.C. Westermann, The Beatles, Cornell, Picasso, Bruegel, Fender, Loid Loar, Churchill. Some young students are doing interesting work in my shop right now. I hope for the best. I suppose I would like to know more about the Apple Corporation. I want them to reissue the 2A3 electron tube for the world. That would be a service to humanity and pay homage to the bedrock of all electronic heritages, including theirs. A seamless integration between the nineteen forties and the present tense. Two functional products with integrated functionality and artistic appeal. 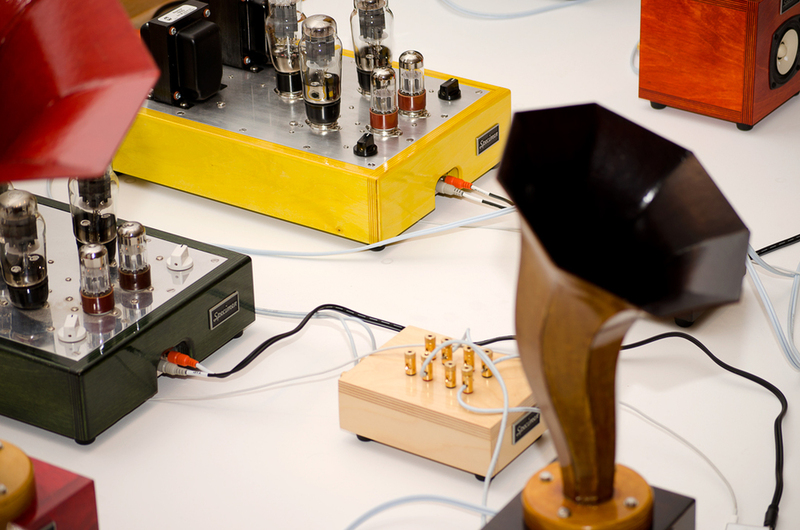 SpecimenTube Amplifiers, Horns and Apple products. Dreamy Huh? Buke and Gase in Brooklyn, Bird (of course), Jack White (careful), Tweedy, Ken Vandermark, Eighth blackbird, Mark Greenberg at Mayflower productions are but a handful of modern intrigues, strangely enough, almost exclusively sonic in nature. Where are the mechanics? There was a time when a girl saw something nice in the dirt under a mans fingernails. Agrarian to urban mythology. 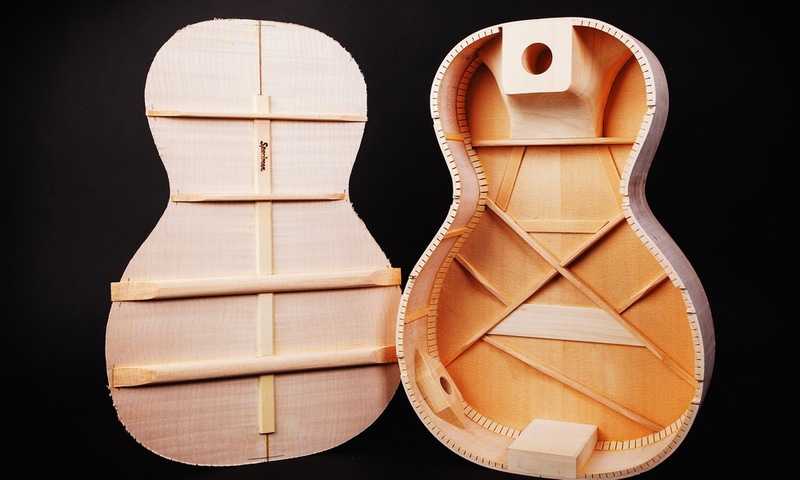 You can see more of Ian's incredible work here, or attend his guitar making classes at his Chicago School of Guitar Making.